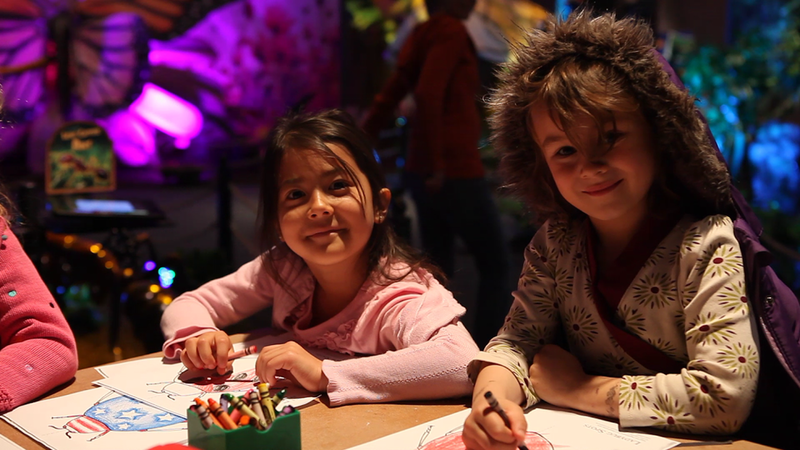 During the 2015 Robot Petting Zoo, 10 robots delighted over 300 visitors at the Children's Creativity Museum. This year, we wanted to expand our reach and allow even more teen designers to exhibit their robotic creations. Our goal was to have 40 teens design, build and program 20 mechanical pets. Each interactive pet would be triggered to move, blink and make sounds when "fed" by children visiting the zoo. To train 40 teens to be robot zookeepers, we broke the session into 2 parts. First, we recruited 20 teen interns for 5 consecutive weekends of skill building and professional development. We built their computer programming and mechanical design skills through a series of workshops, and we took the interns to the Bay Area Maker Faire so they could experience a large scale science exhibition for themselves. We then recruited 20 Robot Petting Zoo makeathon participants. These teens took part in a 16 hour intensive build session leading up to the public RPZ exhibition. Our interns, who had spent the past five weeks learning how to build robotic pets, helped us train this new set of teens. With the combined hard work of all 40 interns and participants, we reached our goal of creating 20 unique robotic pets that could interact with visitors. Over 500 visitors filled the TechHive to experience the Robot Petting Zoo, making it our most visited educational experience of the 2015- 2016 year. Click the images below to get a closer look at these amazing robot pets. Create a miniature parade of line following robots that can be easily customized by the Lawrence Hall of Science visitors.We wanted kids and their families to interact directly with robotics, and to explore linkages and motion transfer systems. Finally, we wanted visitors to have a fun way of displaying what they've learned to others. During the Winter of 2016, the TechHive interns had 3 weeks to design a line following robot, 3 weeks to design a versatile linkages system, and 3 weeks to design the public experience. We wanted to provide this cohort of interns (many of whom had been with TechHive for more than 3 years) with a design challenge that would require them to apply everything they've learned over the years. 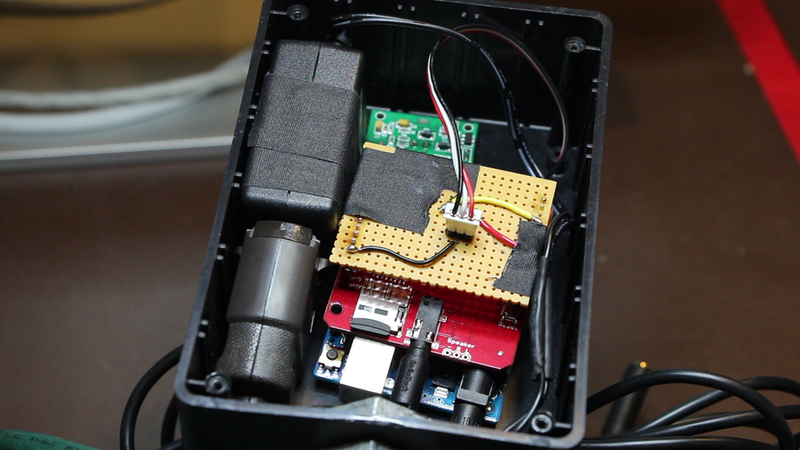 This includes CAD, Arduino programming, cardboard prototyping, laser cut design, and user experience design. The World's Smallest Parade went onto the main floor of the Lawrence Hall of Science on March 12, 2016. It drew over 400 visitors who interacted with the tiny parade robots and learned about the technology behind this experience. High School students had a 10-week session in which they were challenged to create animatronic bots that would be able to explain science concepts to visitors. The Bots had to be understandable and intriguing to visitors of all ages while talking about the exhibit where they were stationed. Each group of five used cardboard as a base to create an Explainer bot. The interns learned a variety of skills during the session, including programming in Scratch; CAD design; 3D printing; soldering; small electronics; and the user-centered design process. Each group was challenged to create a robot with a unique look and personality. They programmed the robot to make different expressions, then wrote and recorded a script that described one of the Design Quest exhibits. 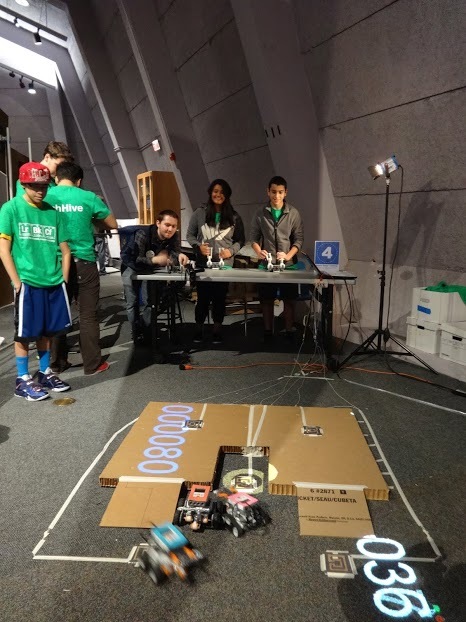 The intern's robots went live on the floor of the Lawrence Hall of Science on the 19th of December, 2015. The Explainer Bot unveiling drew 300+ visitors, who could learn from the bots and interact with their designers. TechHive organized the first Robot Petting Zoo Makethon, which ran May 30-31, 2015 at the Children's Creativity Museum in San Francisco. With the support from funds raised through an Indiegogo campaign, 20 high schoolers from around the Bay Area teamed up and spent two days creating and programming a robotic pet, which they showcased to the public during a "Robot Petting Zoo" event. Day 1 - Makeathon begins! Students were led by TechHive interns and mentors in beginner-friendly programming and engineering workshops that would help prepare for the weekend's makeathon. Students learned how to use the Scratch programming language to operate a Hummingbird Duo microcontroller. The Hummingbird would essentially serve as the "brain" of the robotic pet. Using craft materials such as cardboard and construction paper, robots began to take form as students meticulously went to work. Day 2 - Petting Zoo opens! The Robot Petting Zoo opened midday Sunday, where visitors at the Museum and general public were invited to interact with the pets and Makeathon participants. Visitors had the opportunity to "feed" the robot pets, and voted for their favorite pets. Check out some of the finished projects below! The TechHive designed, built, and operated the Lawrence Hall of Science booth at Maker Faire 2015. Winner of 4 Editor's Choice Awards and 3 Best-in-Class Awards! Visitors first built their button, then they tested their buttons on our testing stations, which were built by our TechHive interns. Once they knew their button worked, they played Mole-a-Whack! Powered by Scratch and Arduino! The scoreboard for Mole-a-Whack was programmed in Scratch. The scoreboard kept track of scores for each individual player and for the team. This program also paced the experience and provided all sound effects. Check out the scratch program here. 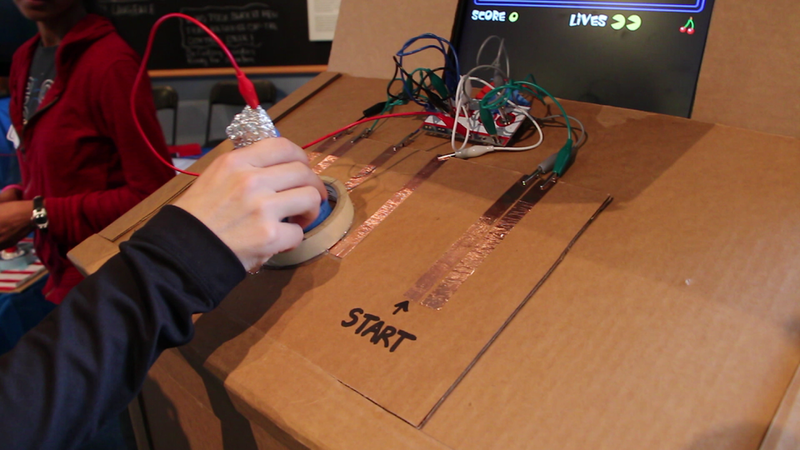 The electronics were powered by the Arduino Leonardo, which sent keyboard strokes to the Scratch Program. 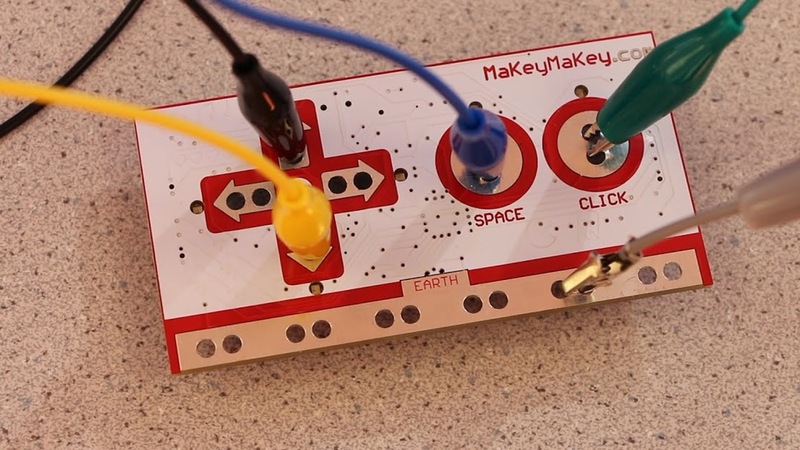 Early prototypes of Mole-a-Whack were powered by the MaKey MaKey. Featured on the Make Magazine Blog too! The Town of Terror was a Halloween festival at Albany High School, designed by the TechHive in collaboration with the Albany High School and Berkeley Engineers and Mentors, a hands-on engineering after school program. It's main attraction was a haunted house called "Escape from Dr. Ella Mental's Laboratory." Albany High School sought an alternative to their annual homecoming dance, which had been poorly attended in previous years. 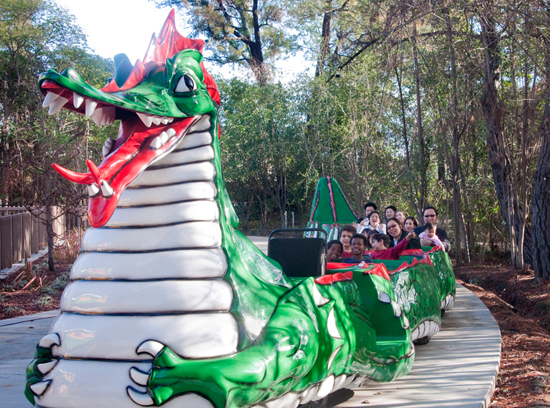 They wanted a fun and inclusive experience that would attract more students and would raise more money for the school. Typical school events raise about $300 to $500. TechHive designed, fabricated, and built a haunted house called “Escape from Dr. Ella Mental’s Lab” and organized a festival called the “Town of Terror” in collaboration with the Berkeley Engineers and Mentors (BEAM), Albany High School leadership team, and adult volunteers from the East Bay. AJ Almaguer, the lead designer, won a Bay Area Inspire Awards to help fund the project. The project planning began in May 2014 and was completed in 5 months time. The haunted house included a “waiting room” with hands-on science training, a dark hallway with Arduino-enabled flying bats, LED lanterns, and a constructed laboratory exhibit with machines called‚ “Elixir Mixers” with user interfaces that were coded in Scratch. The project involved all aspects of public speaking, coding, writing, wiring electronics, carpentry, engineering design, assembly, and construction for the teens involved in delivering the project. Approximately 800 people visited the Town of Terror, which raised $3500 for Albany High School. In addition, 100+ Albany High School students, 30 TechHive high school interns, and 30 UC Berkeley students also volunteered at the event, sharing their enthusiasm and ensuring its success and demonstrating the power of the community. The teen volunteers noted that this experience gave them a lot of valuable experience in project management. The Education department was interested in creating new technology-rich offering into its summer camp catalog to meet the demands of parent customers. 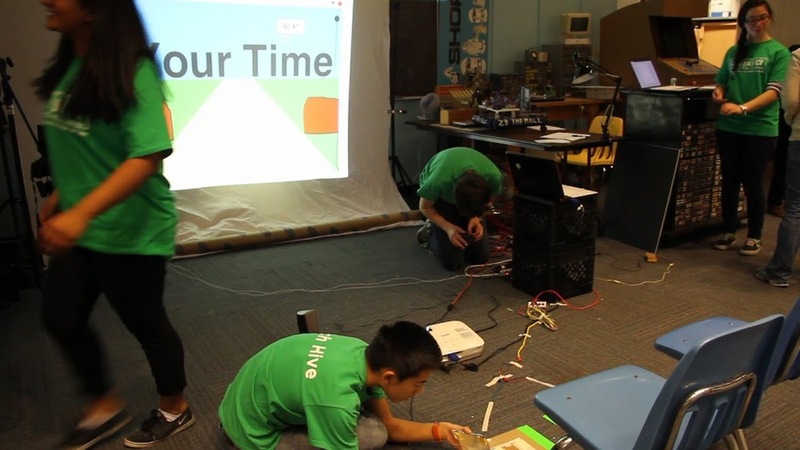 TechHive was faced with turning many early ideas into a 2-week fun summer camp enrichment for kids ages 10-13. The curriculum was divided into two parts - code it and build it. During the build it section, the kids use basic craft materials like cardboard and aluminum foil to create the mechanics of a carnival game. In the code it section, kids focused on Scratch and programming user feedback. Kids progressively developed skills through specific building projects in the first week. Using these skills, kids then designed their own unique game in the following week. The camp ended with a camper-run midway on the museum floor. After receiving coaching, the campers gave presentations of their games to parents and museum visitors, followed by a celebration of playing all the carnival games together. 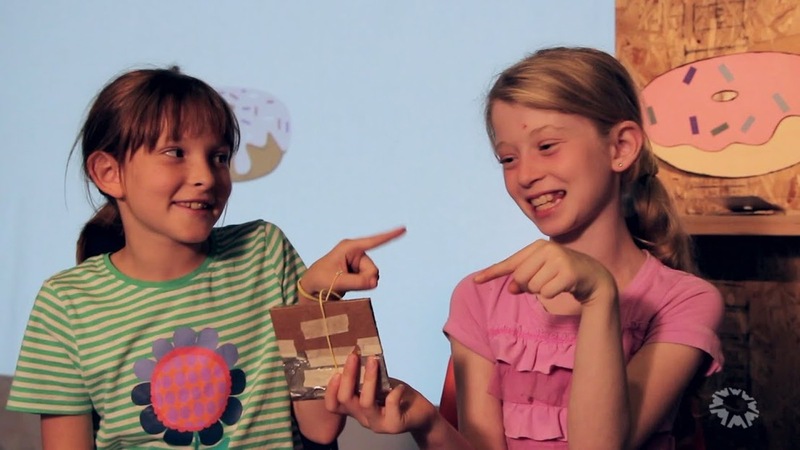 Campers not only gained a solid understanding, practice, and experience of basic programming, but also learned how to build and do cardboard prototyping. Many of the campers remained active in the online Scratch community. TechHive Interns were given a challenge of making a low-cost portable sign for the TechHive studio that could help raise the visibility of the space. Using LEDs, soldering, circuit planning, and cardboard, TechHive staff engaged teens creating the TechHive sign, powered by Arduino. Large letters in a Chicago-style Marquee lettering flash in different sequences. The portable sign proudly hangs in the TechHive studio and lights up the space when the TechHive is hosting special public events, classes, and drop-in programs. The techniques used in making the sign were also turned into paid visitor workshops that teach soldering, introductory circuitry, and cardboard prototyping. TechHive interns help run the workshops based on their learned experiences making the sign. 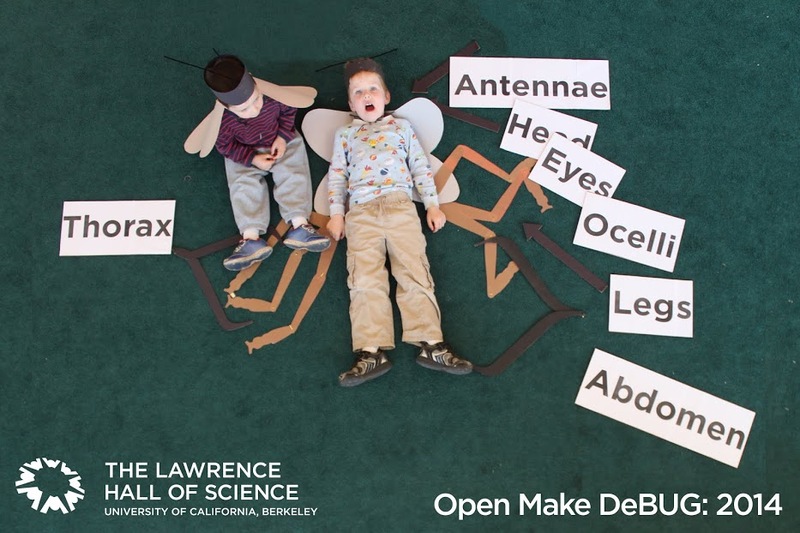 The public science center wanted a photo booth experience for their "Open Make Debug" public program to complemented the traveling exhibition Xtreme Bugs. The TechHive staff and teens created an "Insect-Only Photo Booth," inspired by entomology collections found in natural history museums. 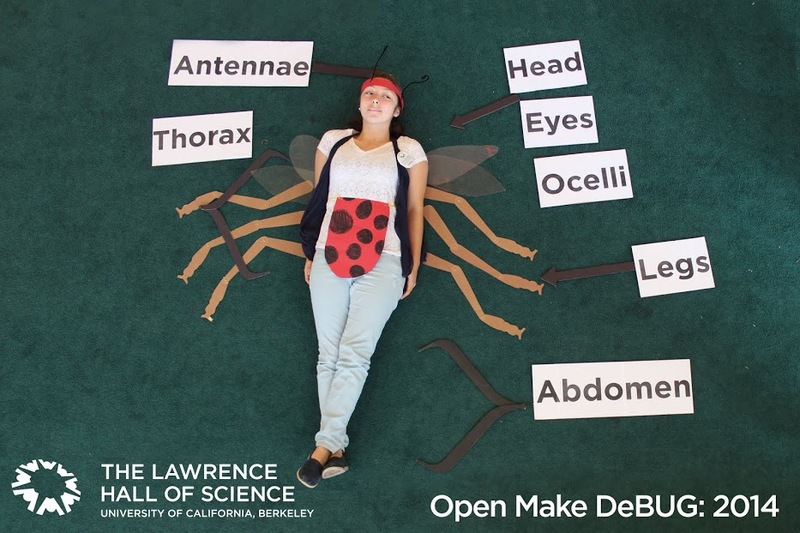 This educational photo booth taught visitors the anatomical difference between insects and bugs by having them compose then pose as an insect on display. Teens created English and Spanish labels using Adobe Illustrator, then printed them for gluing onto cardboard for easier handling by visitors. They tested adjustable brackets for the abdomen and thorax to enable positioning relative to the size of the visitor. Teens interns gained print production experience and user testing skills by making iterative design improvements, as well as learned how to support visitor learning during the event. The Lawrence Hall of Science used the photos for social media to drive traffic to their website and to help deepen visitors' experiences. The Student & Family Programs Department wanted to attract more teens and families to enroll in paid classes and workshops, and offer more experiences that used modern Maker technologies. The TechHive created a series of TechTorials - 2-hour hands-on workshops using Maker technologies for older kids and families. The first was a 2-hour LEDer Sign TechTorial where visitors soldered LEDs, wires, resistors and a power source to create their own light up letter to take home and share. The families were inspired to wire their own electronics project because they learned a fundamental maker skill: soldering. Visitors were exposed to basic electrical concepts like series and parallel circuits. All projects contained both types of circuits. The TechHive was asked to host an event for the First Annual Member Games, a special public program at exclusive to members of the Lawrence Hall of Science. We created a two-player game built using cardboard components and Scratch programming. 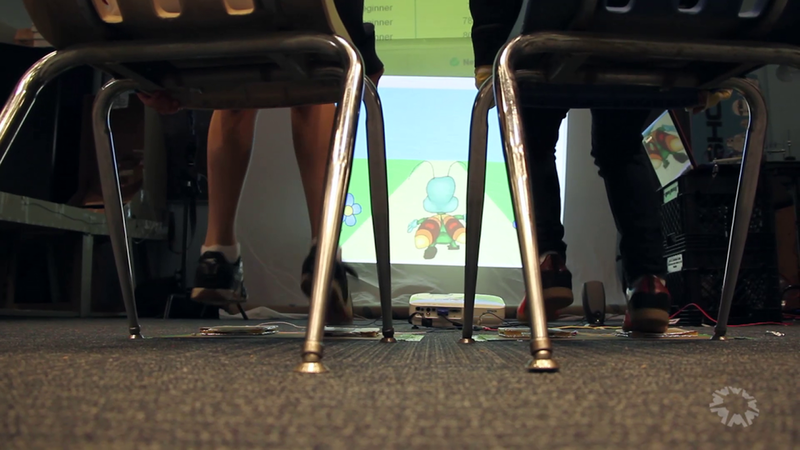 In order to complete the “Bug Run,” teams of two would have to work together to navigate a digital insect through a winding racetrack. The best times were recorded on the leaderboard. The Bug Run was a highlight of the Member Games and TechHive was invited back as designers and facilitators of future Member Game events! Our exit poll indicated that participants enjoyed the game and liked interacting with TechHive teens. 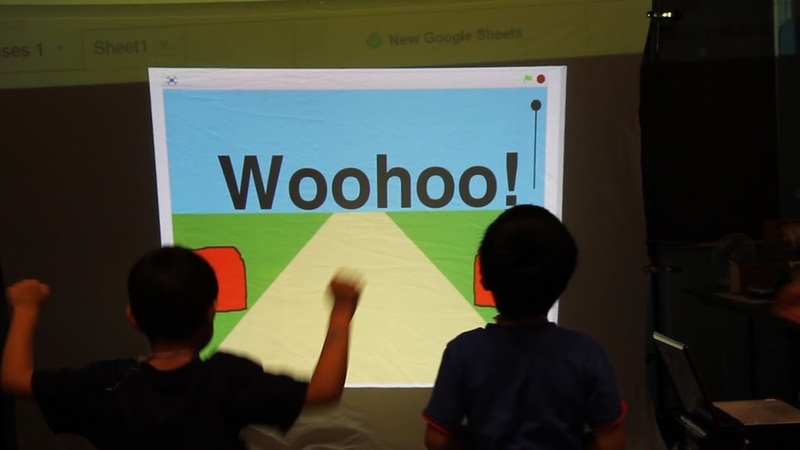 The Member Games proved that simple open tools like Scratch and cardboard could be combined to create engaging user experiences. The cardboard console was featured on the tumblr.com homepage. 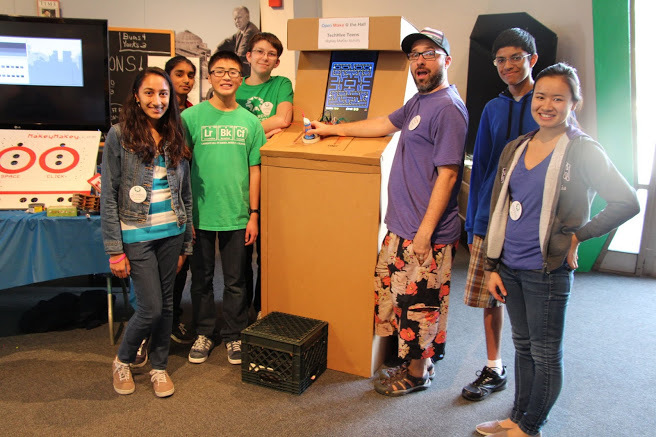 TechHive got to take a photo with Jay Silver, inventor of the MaKey MaKey, who visited the Lawrence Hall of Science. We were tasked to make an exhibit for the Open Make: Toys and Games public program at the Lawrence Hall of Science. Our other challenge was to give the TechHive teen interns hands-on fabrication experience with basic cutting tools as this was one of the first projects completed in the TechHive. We made a 3D Model of a console in SketchUp and then created cut templates to fabricate the model out of cardboard using 123D Make. The templates were scaled to life-size using a projector and all of the parts were hand cut by the TechHive staff and teen interns. While the console was made out of cardboard, the screen was a recycled computer monitor, which was powered by an old laptop from behind. The control board was a powered by a MaKey MaKey connected to the laptop and it was designed by teen intern Alex. This exhibit piqued the interest of the visitors and it gave us an entry point to talk to kids about conductivity, circuitry, and programming. This project was also featured on the company Tumblr's home page for a few days! 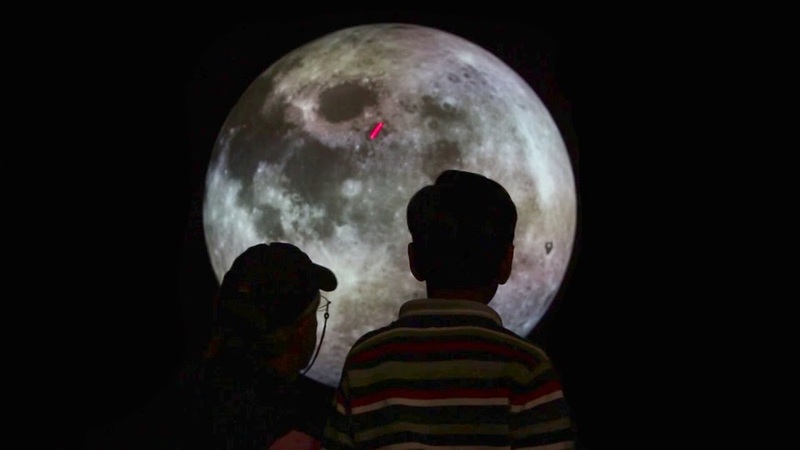 The Public Science Center wanted a public program to coincide the release of their new planetarium show from Google Lunar Xprize. The public program would be showcasing the new planetarium show and the Moonbots-In-A-Box kit. We created a public program called Moon Missions, which challenged visitors to collect stamps at the five stations throughout the museum floor, including the Moonbots-In-A-Box challenge. We also created a new exhibit prototype called "Robot Basic Training" which allowed for three visitors at a time to learn to drive the moonbots by playing a multiplayer game. Leading up to the event over consecutive weekends, TechHive interns learned teamwork, how to test prototypes with visitors, made robot mazes, and wrote and debug computer programs. The culminating event was featured on NBC news. The stamp-passport is now a practice used in other public programs. 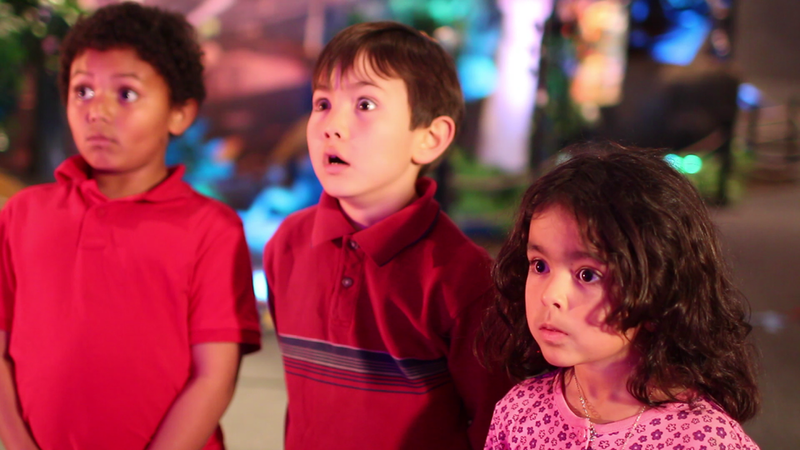 The science center requested a short video to be part of the Fall Appeal fundraising campaign to showcase the impact that its STEM programs have on learners in the Bay Area. We produced a short video which featured two people – a current educator at the Hall, who started her education career as a teen intern, and a TechHive teen intern. The video was embedded in the email campaign and on the Lawrence Hall of Science website. More importantly, the TechHive teen interns gained experience in producing and editing a professional video for a client. The Hall's marketing department wanted to add a media component to its annual holiday card. The TechHive worked closely with the Marketing team to plan, produce, and edit this short, which was published to the Hall's YouTube page and was linked to in the 2013 Holiday Card. This video served as an internal unifying campaign, as it featured Hall staff from many of the departments. Shoes of a Scientist also became a unifying pitch for the collective work at the Hall.